We present to your attention a magnificent demi-season mountain windproof suit "Gorka" made from an airless membrane fabric, warmed with a lining of soft, comfortable fleece. Costumes "Gorka-Winter" are traditionally popular among residents of cold latitudes, where it is important to protect not only from low temperatures, but also piercing wind. 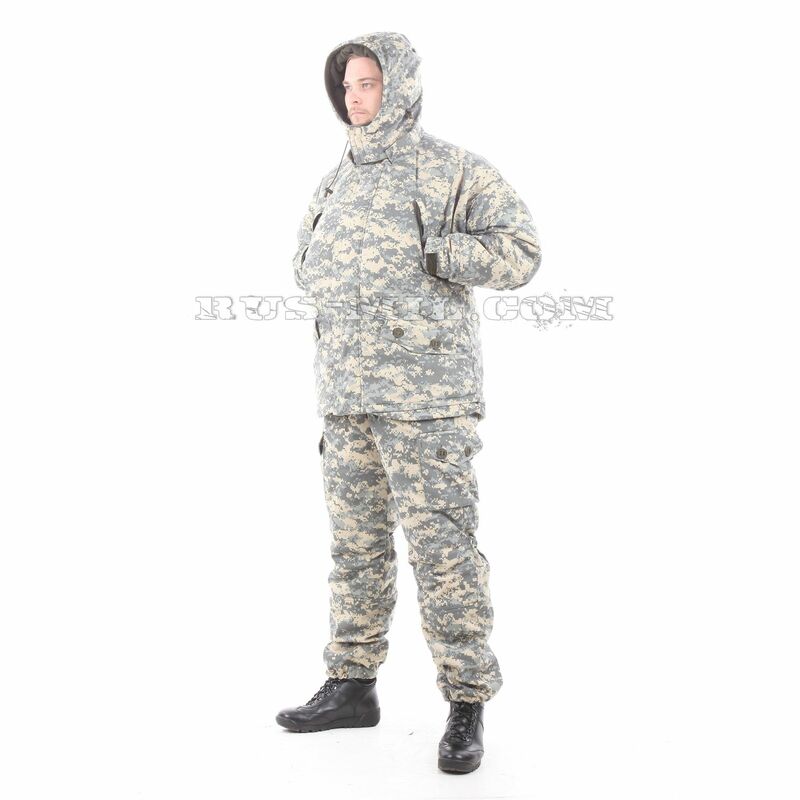 Costumes "Gorka-winter" with an outer membrane insulating sheath are also ideal clothes for snowmobiles and ATVs. 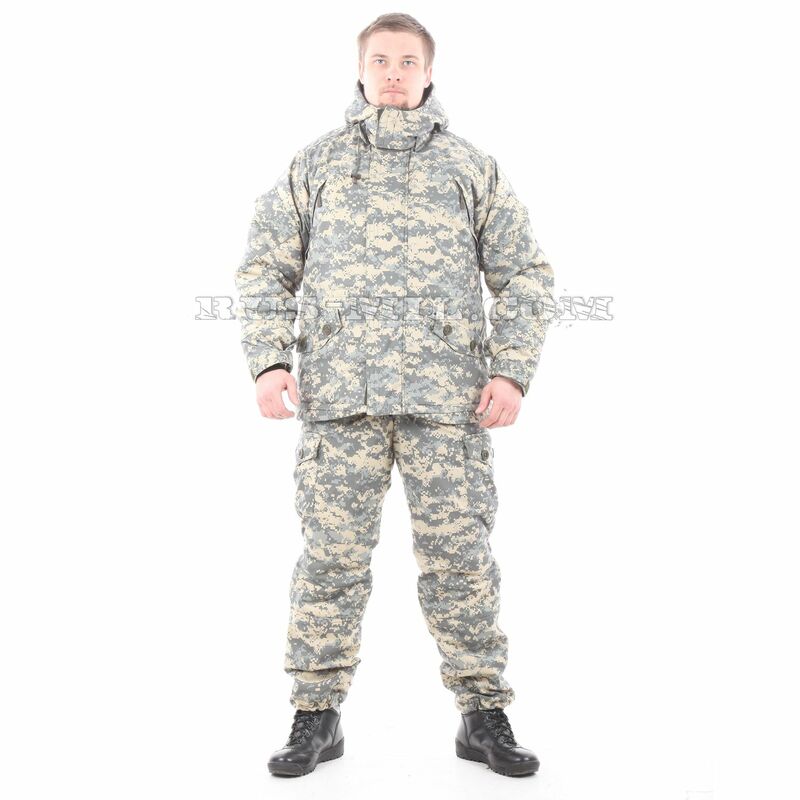 For the mild climate of the central strip of Russia and southern latitudes, the company created a special – light version of the Gorka-winter suit. In the "Light" version, the costume has a design identical to the standard one. The main difference between the usual costume "Gorka-Zima" and light weight is the thickness of the insulation layer: in the second version it is thinner. Therefore, the recommended temperature range has also changed. The established boundaries of temperature comfort for a lightweight "Gorka-winter" suit – from -25 to -5 Co. 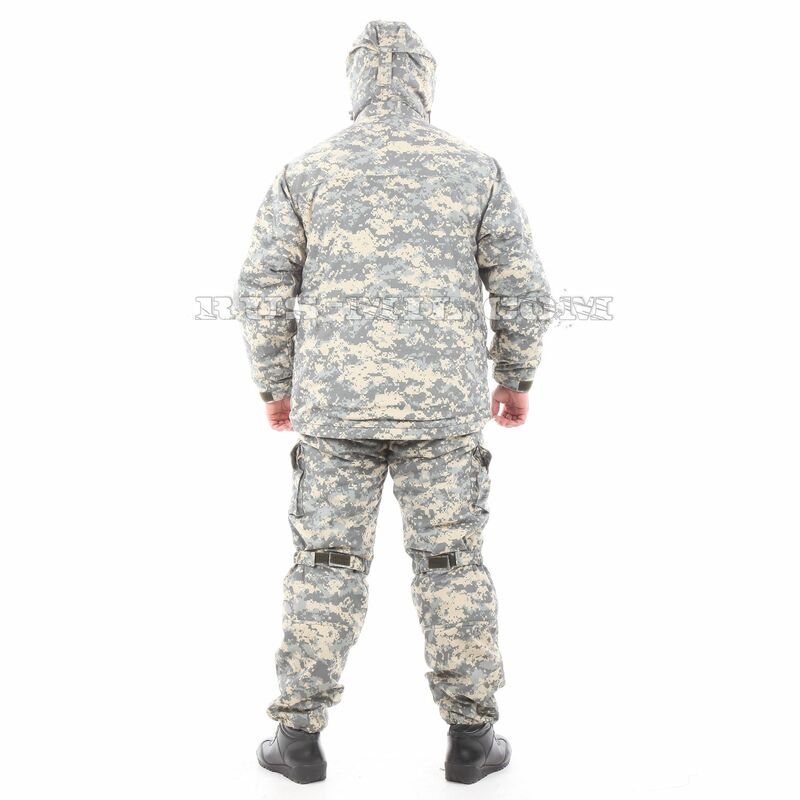 This suit is made of non-porous membrane, which looks like a normal knitted material with camouflage pattern. The front side of the hull "Gorka" has a pile velvety texture. The surface of the fabric remains warm and pleasant to the touch even in a frigid frost, this material collapses noiselessly, does not change its properties in conditions of low temperatures. The suit does not shine in the sun. The protective properties of the tissue are reported by the membrane layer. Thanks to him, the material has acquired the ability to resist wind and water. The membrane layer has the form of a diffusion film deposited on the backing fabric from the wrong side. Lightweight "Gorku-winter" manufacturer warms non-woven material "Holfofeber." 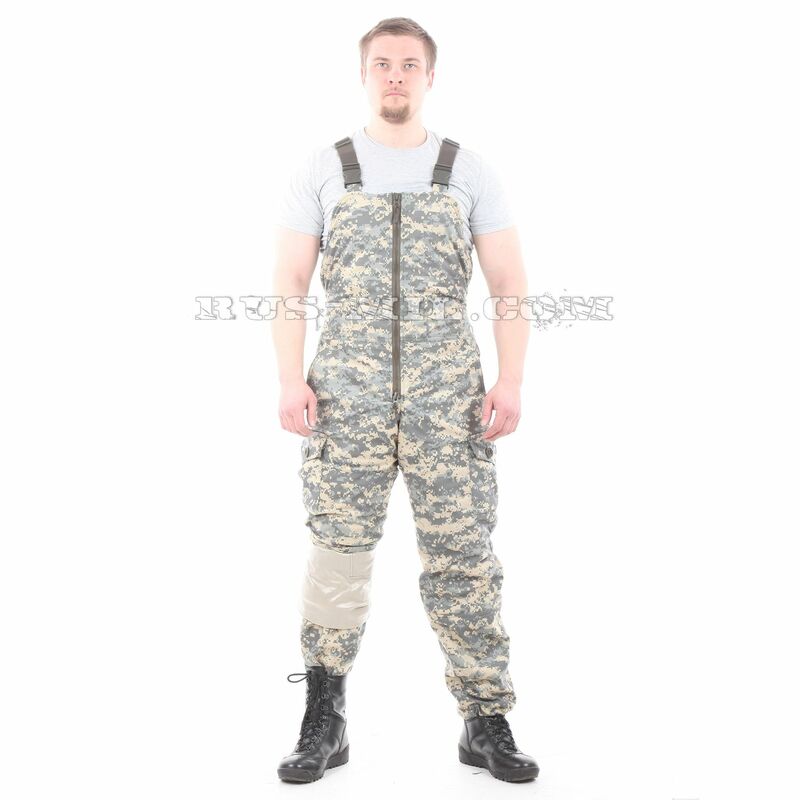 It is the same insulation that is used in the "Gorka-winter" suit of the standard pattern. The HolloFiber insulation is not only beneficial for its ability to accumulate heat generated by the human body. It passes air and steam, is not absorbed by liquid moisture and does not change its properties after contact with water, dries quickly. This heater has no propensity for migration, it quickly relaxes from the small volume. 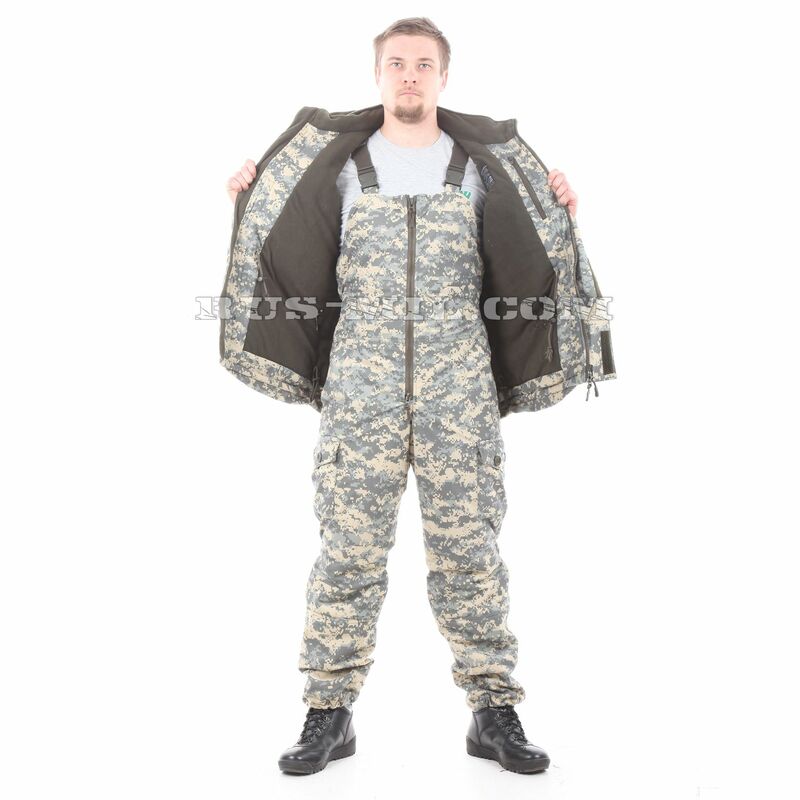 The jacket and overalls are fastened on the front with double zippers. That is, both zippers can be undone from the top down or from the bottom up. The second circumstance is important for the comfortable departure of a natural need in the cold. From blowing, the central clasp of the jacket protects the valve. He's strapped on Velcro. Valves at cargo pockets are fastened with non-stop Canadian buttons. Valves at the arm pockets are fixed to Velcro. 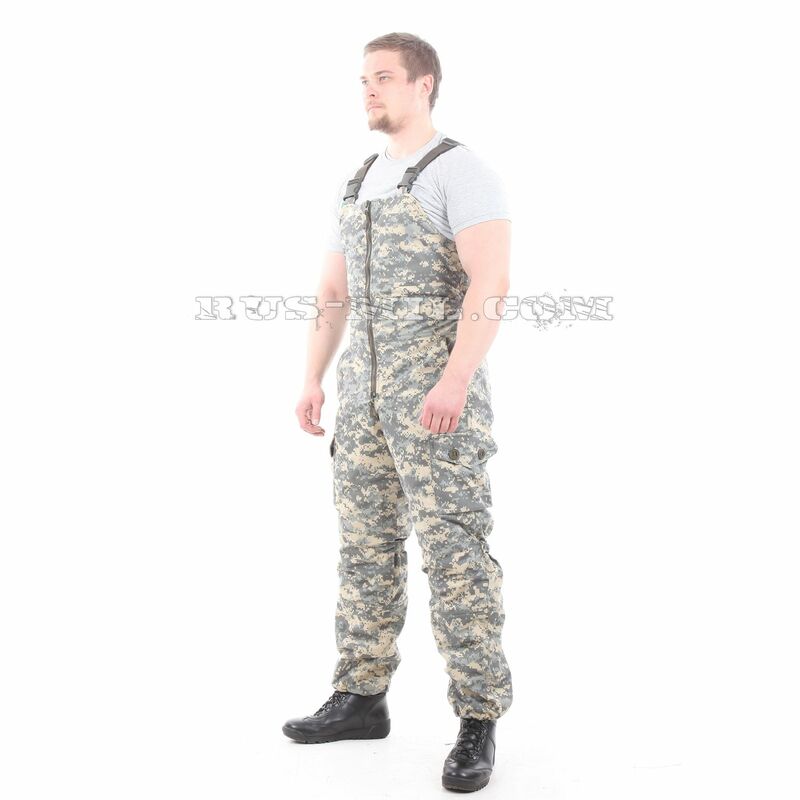 Chest pockets fasten with a zipper type "spiral". Keyrings of locks the manufacturer has equipped with sticks for simple handling by a hand in a glove. The volume of the sleeve on the wrist is regulated by a velcro strap. Inside the sleeve lies a knitted cuff. It does not allow snow and garbage to wake up through the sleeve under the clothes. In addition, the cuff protects against swelling, which inevitably happens when driving an open vehicle. For example, a snowmobile or ATV. Outer shell: membrane (100% polyester), 220g/m2 density. Top layer: knitted fabric, does not rustle. Non-porous membrane: 3000 ml/24 h vapor permeability, 8000 mm/24h water column. Insulation/ lining: hollow fiber soft (non-bulky). Sleeves: 100g/m2, taffeta lining for easy sliding. Torso: 200g/m2, fleece lining (fleece vest) 180 g/m2 density. Below the knee: 100g/m2, taffeta lining for easy sliding. Above the knee: 100g/m2, fleece lining (fleece shorts) 180 g/m2 density. No insulation from mid-calf to trouser leg bottom for easy tucking it into shoes or boots. Two chest pockets with a covered zip. Two bellow zippered buttoned pocket (2 buttons on each); fleece insulated. One small inside “splitter” Velcro pocket in each pocket. Two side pockets with two buttons. 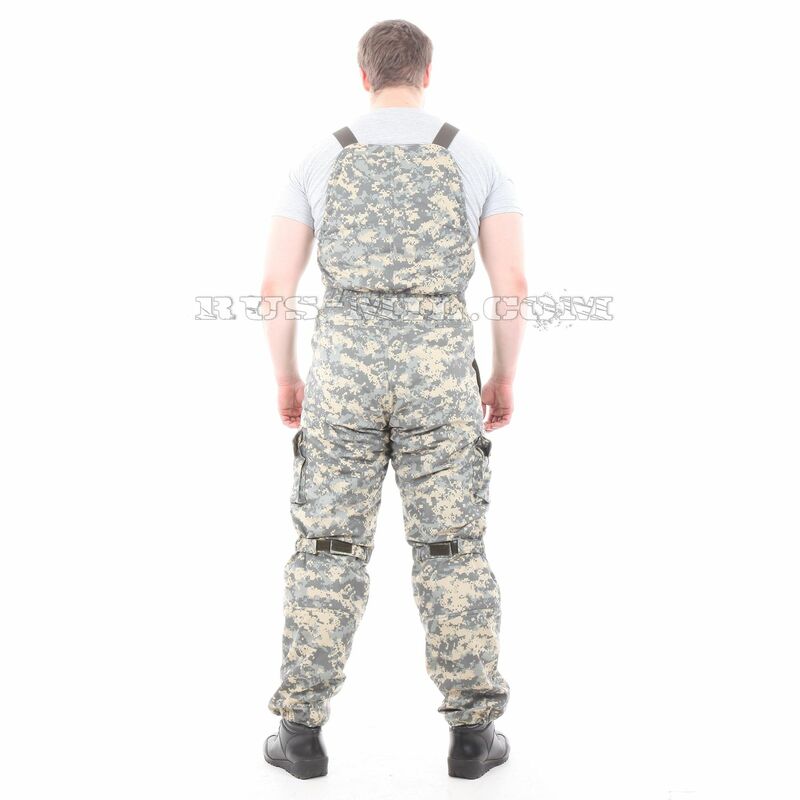 Shoulder area has a loose fit providing ease of movement. A light fleece jacket or a warm sweater can be easily put on underneath. Knitted cuffs on sleeves to keep cold out. Protection of neck and face against “cold” zip. Two-way front zipper with a windproof Velcro flap. Velcro sleeve cuffs to adjust to the needed size. Suspenders: fast adjustment through the entire length. Two-way front zipper with an inside windproof Velcro flap. Two-fold trouser leg at the bottom; “Brakes” on inner trouser leg. Volume adjustment under the knee (at the back). Recommended temperature use rate: -25 Со – 5Со.